As someone who lives in a university town, I can tell you it’s not every day that the university’s and town’s perspectives on a key issue are closely aligned. But that’s the case in Storrs, Connecticut, where the University of Connecticut (UConn) and the Town of Mansfield both agree that what they really want and need is a new downtown center. According to Cynthia van Zelm, who’s Executive Director of the Mansfield Downtown Partnership, townspeople for nearly half a century have wanted to develop a downtown hub for the community. But it’s only been over the past 15 years or so, that they’ve come to realize that for this to happen, they needed UConn to be a partner. Before getting too far into the story, let me back up for a minute a tell you a bit about Storrs. First, and most importantly, said Town Planner Linda Painter -- it’s not actually “Storrs” -- “it’s really Mansfield.” But the name Storrs has stuck -- and, in fact, that’s what the new downtown center will be called. View on entering University of Connecticut campus area. All photos in this post by Wayne Senville. While less than 30 miles east of Hartford, it’s a different world -- with a largely rural, small-town feel. 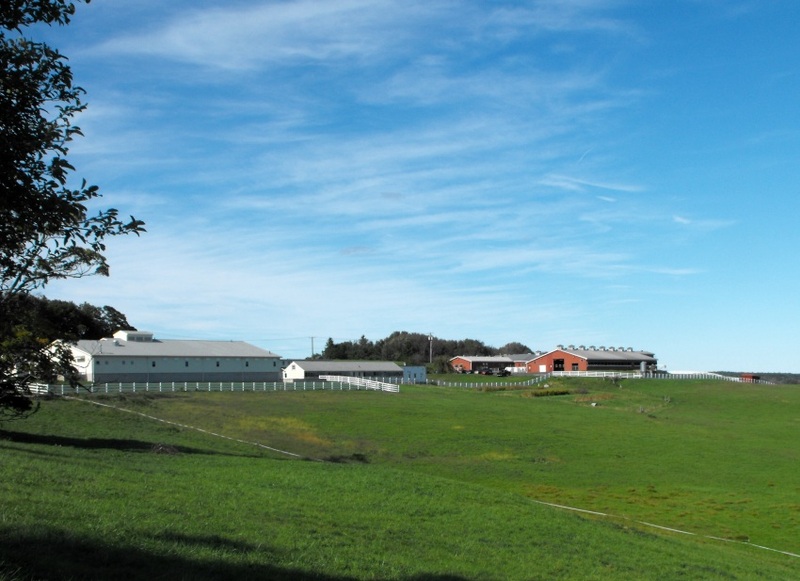 In driving around the town (which I hadn’t visited in nearly 20 years), you’re struck by the farmland, the natural beauty -- and the many joggers and bicyclists. 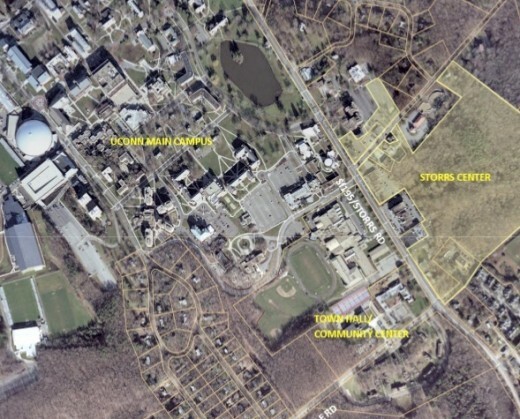 Aerial photo of main campus, University of Connecticut - Storrs. The site of the Storrs Center development is visible on the right. incorporating sustainability and intelligent land use principles -- like building on a smaller footprint with structured parking, and connecting to existing utilities. The end result: Storrs Center -- a new mixed-use downtown hub for the Town of Mansfield, now under construction.